In Iran’s push for a nuclear deal, it’s had few better allies than Moscow. But if an agreement is reached this week, President Vladimir Putin’s regime will have at least one reason to reflect on its support. Russia, which vies with Saudi Arabia and the US to be the world’s largest oil producer, has the most to lose when Iran returns to the global energy market, according to a dozen analysts and executives at oil companies, banks and trading houses interviewed by Bloomberg. "Iran is going to be competing in Europe head-on with Russia," says Ed Morse, head of commodities research at Citigroup Inc.
Iran has been barred from selling oil in Europe since 2012 when the European Union imposed a ban on crude imports. Coupled with tougher US sanctions making it more difficult to buy Iranian oil with dollars, that caused output to drop from 3.6 million barrels a day in 2011 to 2.6 million barrels last year. Russia, whose benchmark export grade is similar to Iran’s flagship blend, has been the main beneficiary of that decline. Exports into Iran’s main markets in Asia and Europe have more than doubled, growing by 420,000 barrels a day from 2011 to 2014, according to data compiled by Trade Vienna Agreement. "The return of Iranian barrels would increase availability of heavy sour crude and would be positive for refiners," says Vasilis Tsaitas, a spokesman for Hellenic Petroleum SA. 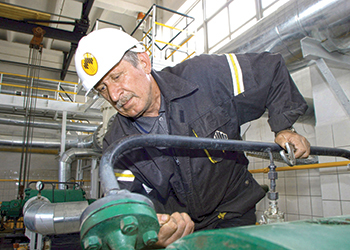 The company operates three of the five refineries in Greece, according to data compiled by analysts. Iranian oil represented as much as 25 per cent of the total feedstock of the company’s refineries until the sanctions became effective, Tsaitas says. Urals, Russia’s flagship crude, replaced those barrels and made up almost 30 per cent of sourcing in the first quarter, he says. Although they’re competitors in the energy world, the countries have been close allies politically. Russia has provided Iran with weapons and atomic-energy know-how, as well as pushing other world powers for a deal on nuclear research that will end sanctions. That agreement could be reached in Vienna during the next few days, and while the return of Iran to the global oil market is still at least six to nine months away, the oil industry is already trying to calculate the impact. On top of Russia, countries from Nigeria and Angola to Colombia and Iraq would face extra competition in Europe and Asia, the traders says. They asked not to be identified to avoid jeopardizing commercial relationships. South Sudanese oil exports are sharply down due to conflicts in both African nations. Nonetheless, Iran’s made it clear it will aim to get its traditional customers back. Exports into Iran’s main markets in Asia and Europe have more than doubled. In May, the Iranian oil minister Bijan Namdar Zanganeh says his country’s priority markets were Asia and Europe. Zanganeh also made Iran’s intentions known at the June 5 meeting of the Organization of Petroleum Exporting Countries in Vienna when he presented a letter to fellow members urging them to make way for his country to pump 4 million barrels a day, the level in 2008. Urals has similar specifications to the Iranian crude Europe’s refiners used to import before sanctions. "It’s probably Urals to a certain extent that would be competing with resumed Iranian exports into Europe," says David Fyfe, head of market research and analysis at oil-trading house Gunvor Group Ltd. in Geneva. Iraq’s Kirkuk crude, which is of similar quality to Urals and Iranian oil, may also face competition in Europe, Fyfe says. Gunvor, originally founded by Russian billionaire Gennady Timchenko, is one of the five largest independent oil traders and known for expertise in the Russian oil market. Extra oil from Iran will also compete with suppliers in West Africa, already under pressure from the growth in shale production in the US, where they used to be a key supplier. Nigeria and Russia both tend to rely on spot-market sales making them more vulnerable to competition from Iran, says Eugene Lindell, a senior analyst at Vienna-based consultant JBC Energy GmbH. Oil refiners in Europe are already preparing to resume buying Iranian crude. "Saras would look to buy Iranian crude again both on a spot and term basis," says Marco Schiavetti, director of supply and trading at Mediterranean-based refiner Saras SpA, adding the company is in regular contact with Iran.